Monday April 30th, What a Day! We have had such a fun day here at the Dismuke house. Last night, my mother, also known as Mimi, came into town to spend a few days with us and Craig's mom, also known as G-mommy, will be here for the last half of the week. It's almost like the holidays with family around, especially if you add all the presents on top of that. They both live out of town and when they're here, you can be guaranteed that we've asked them to come and help out with the kids. Our original schedule changed and we were off today instead of starting Radiation. It was a great day to be off too; it was a beautiful day with not-to-much sunshine and plenty of playing for Ingram. He played baseball in the yard (shocking, I know) and painted on the back porch with Mimi (Mimi's not even the artsy type...don't tell her I said that because I might get in trouble)! We also had company that came to visit a bit and when that happened, Beau decided that it was his turn to paint; let's just say red paint looks pretty good on a black and white dog. Since mom was here, I ran all over town knocking out a list a mile long. It was kind of nice to get a ton of things taken care of because once Wednesday rolls around, the only days off will be Saturdays and Sundays and we don't really know how Ingram will react to the treatments. I guess in my head, today was the last normal day we're going to have, but even it wasn't normal if you know what I mean. Neither of our families live in town, so to have them here is abnormal and means that a lot happening and we need extra help. Oh, so I'm not sure if I told this or not, but Lindsey hurt her ankle during Madion's party Saturday at SkyZone If you're not familiar with SkyZone, it is basically "Trampolines on Steroids" inside a warehouse and keeps the Orthopedic docs in business. She stayed off her foot the rest of Saturday and we were thinking this may be bad. Well, Sunday the swelling had gone down a little and she was putting pressure on it and somehow she talked Craig into taking her back to SkyZone for a friends birthday party. We can just say here that I didn't think it was a good idea, but they had fun so that's great. Sunday night she started limping again and continued to limp Monday morning; she went to school, then to soccer practice, then called me and said it was really hurting and I needed to take her to the doctor. So I finally gave in and took her to our orthopedic clinic to their nightly walk-in clinic and lol and behold she's in a boot now. These sort of things are normal for our kids, wait no really for our whole family because someone is always getting really hurt, so it doesn't really phase me anymore. It's happened so much that it's just another co-pay to make and funny picture to take. So in honor of Lindsey saying "I told you so Mommy" about a thousand times, check out the picture below and you can see how excited she is about being the center of attention...oh sorry, I meant how excited she is about having a boot. "I Get a Boot! I Get a Boot!" Saturday and Sunday April 29th and 30th, Recovering from 10 year olds! Wow! The previous post where I said we were crazy was an understatement...we're insane which takes everything to a different level of craziness! 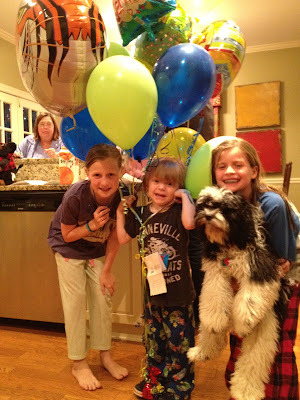 Madison and Lindsey had a great time at the sleepover and so did Ingram. The girls were all over Ingram and wanted to play with him and hug him and sit by him at the table. It was great and he was loving it! When we were all leaving for SkyZone, he started to give us a "What about me?" look ...then our fabulous babysitter asked him if he wanted to play baseball and off to the front yard they went. I bet I've thrown a million balls to that little stinker and he hits the majority of them. Then we have to chase Beau around the yard to get the ball back so I guess he's doing plenty of physical therapy at the house too. You see, Beau doesn't know ANY commands yet; no take that back, he knows "sit" and that's about it. So if any of you know a short cut to dog training, feel free to send it our way. We did have an exciting adventure to St. Jude during the middle of the night to add to the lack of sleep that we already were experiencing from the sleepover. Did I mention that our house full of sweet girls were all up till around 1AM Saturday morning??? We were at St. Jude from about midnight to 3:30AM so I'm guessing we're hitting the beds early tonight. Thankfully, Ingram quit vomiting and his fever came down enough for them to let us go home; we were 2/10's of a degree away from his port being accessed for the first time so that they could get cultures and give him fluids. He was so proud of his five stickers that he earned while he was there for getting his temperature taken about 20 times. Trust me, a thermometer at 2 in the morning is almost as scary as a needle! Ingram is much better now and is back to playing baseball in his pajamas in the front yard. He also is back to saying "HEY" to everyone that walks by the house. Mommy said "Way to go Ingy!" Ingy said "Hurry! Get it Mommy!" Lindsey said "Hurry Beau! Get it!" So today was super fun at St. Jude! Our super short day included two appointments and a yummy lunch that included two orders of tater tots and two bags of chex mix (those were just for Ingram in case you were wondering!). Ingram got his bandage from his port surgery site and the incision cleaned and then he had a ball playing with his gal in Physical Therapy. I'm including a video at the bottom of the page that shows him being a rock star on this thingie that's he moves across the room and back. He was trying to run me over!! He also played hockey with a golf club and ball, threw frogs in a basketball goal, and threw tennis balls on a velcro target board. Once he gets going, he pretty much turns into a crazy little man with a bat or club in his hands! Speaking of crazy, we have a house full of 10 year old girls from school spending the night tonight and then we're heading off to a jumping place in the morning to celebrate Madison's birthday. It's 11pm and they're all still awake with no end in sight! I think after tomorrow, we're going to all be taking a long afternoon nap to celebrate being done celebrating. Oh well, I guess she'll remember this birthday for years to come as her crazy parents agreed to her crazy ideas during a crazy time. Oh well, what can I say....we're all pretty nuts here at the Dismuke house, just ask anyone that knows us and I feel certain that they'd agree! Back to St, Jude today. First off, Eye Clinic! Ingram loved the first part of the exam and was telling the sweet lady all the pictures he was seeing and I'm proud to report he got them all correct. Next up, we (the sweet, sneaky eye lady and the always sneaky mommy) were putting drops in Ingram's eyes and he wasn't too fond of the experience. Since it was going to be a while, we headed down to get a snack in the cafeteria of eggs for Ingram and grits for Mommy. "Ingram Dismuke to the Eye Clinic, Ingram Dismuke to the Eye Clinic" came across the speakers and we hightailed it back for the search for T-Rex in Ingram's eyes. You see, when they did his Hearing evaluation, they apparently found Thomas the Train and Sir Topam Hat in one ear and Lightning McQueen in the other so we had already been talking about what they were going to find in his eyes. He passed with more flying colors and loved the glasses they gave him so much that he wore them inside for a while. Next up, Speech, well sort of... We apparently were running so far behind looking for dinosaurs that we missed our next appointment. Oh well, we had an early lunch and were fine with it. After that, we were called to come to our Clinic appointment early and then found out that our Physical Therapy was going to be early too. We were both starting to get excited about being done before 4! It turns out that we were finished by 2 and made it home two hours earlier than expected. I think God had our day rearranged because He knew how tough yesterday was. All day long, folks were sending me messages and calling. It seemed that little bits of peace were falling upon me and Ingram as we went through our day. I think it might have been our most "fun" day at St. Jude other than when Paula and Ally were with us. We got home before the girls did and Ingram even took a nap for about 4 hours; of course it's after 10pm right now and he's just fallen asleep! That little nut is so funny and acting so much more like he used too. He's even talking more of his normal voice which he lost for a while after his surgery. He's a trooper and I sure am proud of him. Oh Yeah! I'm Wearing My Shades Inside! Ingram is getting quite a collection of toys from the treasure chest at St. Jude. Every time he has a poke (anything involving a needle) or a MRI or a CT, he gets to pick something out of a treasure box. He's picked out a dinosaur, a little space ship, a noisy stick thing, and stickers; but today's treasure chest was the kicker! If you don't know this already, Craig is terrified of snakes...crazy huh? Ingram has always passed up the snakes in the treasure chest until today... as soon as he pulled it out, he said "Mommy I'm going to get Daddy with my new snake!" The picture below was the last time Ingram really smiled today. About two minutes after this picture was taken, the whole team came in and proceeded to discuss what was going to happen during the next few hours. Then I suited up in a space suit, carried him into the OR, and held him as he drifted into lala land. Ingram had his port put in today and he did a great job. He's really sore and isn't very happy when he has to be moved. I put some medicine in his drink tonight to help him be able to rest better; he still doesn't like to take medicine since all this began at LeBonheur so we have to sneak it in his drinks. I don't think I realized how much of a real surgery this was until I left the room with him laying on the table. Granted, today's procedure was nothing compared to brain surgery; but, I was by myself when I came out of the OR and it just hit me like a load of bricks that my baby's on the table and I have to trust that God put these doctors and nurses at St. Jude to take care of Ingram and to take care of me today. It was a tough day for me all the way until the girls were in bed for too many different reasons to name. I think I was almost to the meltdown point because I was starting to beat myself up over things I need to be doing as a mother, as a wife, and as a friend. But my sweet husband reminded me that I needed to be doing exactly what I was doing...focusing all my energy on our fight for Ingram. Once the girls were in bed, Ingram was in the den with my husband and a few of the same men who prayed with us at LeBonheur praying over Ingram again. As they're in the den praying, I was in the bedroom texting with one of their wives getting our plans for tomorrow figured out. You see, Ingram and Lindsey broke Lindsey's glasses a few weeks back. They've been fixed and are for us to pick them up. So my sweet friend is picking up not just one, but both my girls, after their tests are done at school along with her own daughter and getting the glasses and grabbing some lunch. I feel like we are so lucky to have friends that pray for us, pray with us, and do just about anything in the world for us. I'm Going to Scare Daddy with my New Snake!! Today was a rough day at St. Jude. Ingram did great in his test radiation run, although there are no longer any effective tricks to keep him from noticing incoming needles. Apparently he is a fast learner. Today was rough because our main doctor was notably more concerned about Ingram's prognosis. Ashley and I have been weighing our treatment options for the past week. The protocol for treating anaplastic ependymomas is less defined than for some other types of cancer, and there is some element of choice as to how we treat it. Radiation is a must but chemotherapy is optional, having not proven to be effective in treating ependymomas. However, St. Jude is in the middle of a study comparing patient results who are treated with chemotherapy and radiation and those just treated with radiation. So there is obviously some debate as to the efficacy of adding chemotherapy to the radiation. We were torn but had come to have a peace with either treatment route. After looking at the molecular structure of Ingram's tumor for the third time this morning, and talking further with the radiologist, our doctor recommended abandoning the protocol and throwing everything at it that we can. Apparently, the tumor has characteristics that indicate it is more aggressive than we initially had hoped. That news was discouraging. So our treatment route is now determined and will include six-and-a-half weeks of focalized radiation and four months of chemotherapy. Days like today make it abundantly obvious that even in the midst of the best doctors in the world, our hope is in God. Please pray that God would do His work in and through Ingram. Please ask that He will heal his body. On a different note, St. Jude is an absolutely wonderful place. The collection of talent they have assembled in Memphis, Tennessee is overwhelming. We have had doctors at every step in this process who are considered the best in the world in their respective fields. That allows us to rest knowing that we cannot find a more informed opinion elsewhere, freeing us to take care of Ingram and our daughters. As a father, I cannot tell you how significant that is. You can't trick me; I'm not smelling that mask! Monday April 23rd, Birthday Lunch!!! I arrived yesterday afternoon. For some reason, I assumed that things would be different around the Dismuke house. I think I expected a quieter, more somber mood at the house. Definitely not the case. But I love it. The girls still run around and yell about everything. And Ingram, oh Ingram. He is legitimately the Conquerer. He still fights. He still climbs. He still builds and crushes. Most assuredly my favorite kid in the world. The craziness didn't stop when we went to Dogwood Elementary today for lunch. Ingram has a radiation test run tomorrow so we did Madison's birthday lunch a day early. Ingram was a star in the lunchroom. The girls wanted to have me pick up and walk him around the lunch tables to say hello to everyone. So obviously we did that. Then Ingram decided to solidify his superstar status by walking around and putting stickers on the all the students in Madison's class. Killer move on his part. Nail in the coffin was sitting on the steps in front of the lunch room stage and hanging out with a pack of girls. Watch out Geramantown Baptist Church Weekday Preschool. The kid has some serious game. I think the girls really enjoyed having Ingram around. They were able to show off his scar, which Madison used to get in good with boys in her class. Then Ingram and I crushed all those boys and told them to back off our sister . . . just kidding . . . but seriously, get off her. I have to head back to Birmingham tomorrow; but spending time with the family has given me so much hope. Ingram is a stud. The Dismukes are studs. But I have been reminded more than anything that Jesus, the one true God, is the Creator of the universe. He knows cancer in and out. He knows Ingram's body in and out. So my hope is in Christ! And that's what the Dismukes always do to me. I'm always pointed to Christ. For Ingram's sake, hope in Christ. Only he is worthy of our hope. Lindsey's a Second Grade RockStar Today! Sunday April 22nd, Sunday Funday! So today was a great day! We all needed to catch up on some rest with the craziness that has been going on and decided to stay at home this morning. We had a huge breakfast (waffles, bacon, eggs, and fruit) and then started playing upstairs in Ingram's room. We knew we were going to have company later today, so we were also getting ready for them to come out and play. We needed to get some birthday supplies for Madison (she turns 10 Tuesday!) and we did that while she was at a friends house for a couple hours. Aaron came in town today and will be with us till Tuesday; you'll have to stay tuned to see what we do tomorrow! Jackie and Marlon also came out to see us and play with the kids. I've never seen my kids (Ingram included) fly higher in the air than when Marlon gets a hold of them. Other than being a nervous wreck while Ingram was running around outside, playing with Marlon and Aaron in the yard was one of the most "normal" things Ingram has done since his surgery. He was playing baseball, hide-and-go seek, and trying to go all over the playground including the slide and swings! It did wonders for my soul to see him running, although wobbly, and playing just like a 3 year old little boy should do. The Kids with Aaron, Jackie, and Marlon Playing Outside! Saturday April 21st, Who's in Control? Wow! It's almost like we're normal again for a couple days with no hospital appointments to make. We're all recovering from lack of sleep and enjoying having a little time together and with friends at the house and around town. It seems like we can't go anywhere without bumping into folks that we know or that have heard about Ingram. It's great....especially for me! You see my mom still calls me "the drill sergeant" because I had my kids on such a tight schedule when they were babies and toddlers. I wanted to get them on a schedule regardless of what was going on so that they would all be happy. All that to say, I don't think I'm the drill sergeant anymore. The only real schedule I have is hopefully getting Ingram to take a nap, when I'm able, and hopefully getting my girls in bed before 10pm on any given night, including school nights!! What might have taken 30 minutes before now takes a couple hours to do, especially when we're out and about. Here's a perfect example...today we had soccer as usual and then needed to run into Target for a couple things and an hour and a half later, we were checking out. We got 10 feet inside the door and ran into friends and spent 30 minutes talking with them. Then we were going down the main aisle by the registers and ran into one of the girls friends from soccer and talked with them. It turns out, the mother knows one of our doctors and then we found out we live near each other as well. I've given up trying to be efficient when we're trying to do things and now really enjoy talking to friends and strangers alike. There are many things I'm learning and God is at the core of all of them. Right now, He's choosing to impress upon me all things control. He's teaching me about giving up doing what I want to do and doing what He wants me to do instead. Sometimes being in such a hurry turns me into a grouch, especially when the kids want to touch everything they see at the store. Then I'm like, no, put that down, get back in the buggy, and who knows what else I'm saying to my gifts from God. Now we're slowing down and enjoying talking to friends and strangers alike because that's who God put in our path. Jeremiah 29:11 says "For I know the plans I have for you, declares the Lord, plans for welfare and not for evil, to give you a future and a hope;" and even though we have no idea why God is taking us down this path with Ingram, we know He already has it all planned out because He is the one in control, not me. Sometimes, it's our friends who need to talk to us so that they feel better about the situation and other times it's one of us who needs to talk to a friend. God uses even simple things like running to Target to show us even more how He orchestrates our lives together and puts people in our paths to show us His love. Forget the Schedule; We're Still Playing at 9:30pm Tonight! Friday April 20th, Disorderly Conduct! I had this notion in my head last night when I went to bed after midnight that maybe, just maybe, Ingram would sleep late this morning since we didn't have to go anywhere. Boy was I wrong! Just like clockwork I hear..."Hey Mommy, my stomach is hungry!" My reply was "Are you sure? Don't you just want to sleep a little more?" He replied "No, I got all my sleepy out" and so our day started out just as he had planned the night before. We were really quiet since the girls were still asleep and had plenty of time to get ready for school. So we started out watching a cartoon and eating a rice krispy treat for breakfast. Don't make judgments here, it is cereal you know; it just has a few special ingredients added to make breakfast extra sweet! The girls finally made their way down and headed out for the bus when they were done with everything. Beau escaped out the door and proceeded to run around the yard with our bus buddies. Once they were gone, we really got our day started with tons of things out all at once. Normally, we try to just do one thing at a time, but today was our first day off so we went a little ADD with the situation. We had company today for a little bit but she had no idea what she was in for! Terri came bearing arms full of food and gifts for not only Ingram but also Madison and Lindsey. We had a great time visiting and as she was leaving Ingram even gave her hugs and kisses. Once we got outisde, Ingram shot her with his nerf gun and Beau jumped all over her and even jumped up in her car to go for a ride. What can I say? The Dismuke males (Craig and his Dad included) are known for their mischievious side; I would start telling about some of the college pranks that they both pulled but I don't think there's enough space to do that here. Anyway, she left laughing so I'm assuming she thought it was funny too. Ingram continued to have a fun day at home and even managed to take a two and a half hour nap AND he didn't throw up at all today. He was pretty much acting like his old self again but for some reason he likes to point out the "poke" in his back from the spinal tap to everyone we run into. I never would have thought a pinhole would trump a 5 inch incision. Madison and Lindsey each had a friend spend the night tonight since things are going to start changing more next week. We headed out to Chic Fil A for a quick bite to eat and Ingram didn't even complain when I told him he couldn't go to the playground after he finished eating even though the girls did. We got back home and they were wild as ever. I can honestly say that Ingram did his brotherly duty tonight by getting into both of his sisters stuff and messing with their friends just like a little brother should do...and they'd have it no other way. They were also shooting this awful loud laser gun around the floor for Beau to chase. He chased that light around the house for about 30 minutes and his tounge was dragging the floor by the time Ingram was ready to go to bed. Beau helps put Ingram in bed for both nap and bedtime and it's really kind of cute. Of course, bedtime gets dragged out a little longer now, but it sure is cute! Today started out great...for the first 30 minutes that Ingram was awake. He woke up happy and was ready to "get a move on" and see his friends at Preschool before we headed to the hospital for the day. His girls left for school and then I was finishing getting ready so that we could leave and Ingram started acting a little on the whiny side and wasn't his happy self from the previous 30 minutes. We continued to start to head out to see his class and he started throwing up after I had buckled him up in the car. He was actively throwing up and I couldn't unbuckle him as he was doing it so we were using his brand new Thomas blanket to catch it all. He loves taking it with him to ride in the wagon because it's so soft; don't worry Ferebee family, it's all clean now and he's sleeping with it as usual! I called our clinic and they wanted to see him before starting out at our appointments so we didn't make it to see his class after all. We saw our nurse and the thought was that it was still the "rebalancing" of everything inside his head that was the culprit. That made me feel better and we went on to our appointments with Ingram perking up too. Oh, so in the midst of the vomiting I got a clean shirt from the house, but neglected to realize that his pants and underwear were soaking wet until I pulled him out of his carseat in the parking lot of St. Jude. That's a mistake I'll not make again; we'll always have a change of clothes ready and waiting with us. The clinic gave us some pants that were about 4 sizes too big (that's all they could find) so we rolled them at the top and at the bottom. Daddy would be proud of his little man being excited about going "commando" in the underwear department for the day! We also ate lunch in the cafeteria with Paula and Alli in between appointments so that was another fun thing. I say "ate" loosely because while we were eating, Ingram had to go to the bathroom twice within 5 minutes and then the third time he needed to go (just 2 minutes after Paula and Alli left for their next appointment) he threw up in his plate instead. I'm telling you, it's always exciting being around us; you just never know what will come up...I know, bad choice of words, forgive me. Okay so now I'm second guessing the rebalancing thing, but we move on to PT and Ingram has on these huge pants. He starts out of the wagon and what happens? Yep, his pants fall down and there's no underwear. I decided to put his wet pants and underwear back on him and then he has a fun time playing basketball, hopscotch, bowling, and a tossing game. It's hard to watch when he can't do it; I just want to hold his hand and help him do it all. Knowing that he will get better and that he loves playing with his PT gal makes it easier. We had a few other appointments and then made it back to E clinic for our appointment with our surgeon. I told him about the second episode and he had a look of concern on his face (so of course I did too) and sent us straight to have a CT scan. He was concerned about possible pressure/fluid building up inside Ingram's brain but the scan looked the same as the MRI from Monday. What a relief! I was starting to get a little nervous that we might be having another brain surgery and I wasn't exactly fond of that thought. We were getting our schedule for Friday and received more great news. Our line placement has been cancelled for tomorrow so not only do we have Friday off, but we also have Monday off!! We're having pajama day tomorrow ALL day and we're soooo excited about it. We're watching movies (he's already picked Car and Cars 2) and coloring and playdoh all day long. So friends if you're coming over, you better be in your pajamas too and we'll have a great day together! Today Ingram woke up happy and was once again hollering for food. That little man can eat when he decides he's hungry. Once the girls got on the bus we left but by then we were already running late for our first appointment of the day. Thankfully, our scheduler is so understanding and was able to rearrange our first appointment so that they weren't waiting on us. We were just going to be a few minutes late, but as we got to an intersection with a gas station, all of a sudden Ingram decided he REALLY had to go to the bathroom. Once at St. Jude, he happily goes in and picks out his wagon for the day and we load up and start rolling...around and around and around. Okay so it's our fourth day to be at St. Jude and we're still learning our way around through all the halls and turns. Luckily for us, they have all the walls painted and once I start to see flowers or snow on the wall, I know we're getting close to our home base which is E Clinic. We also know just about where every bathroom is and of course where the food is! Today by lunchtime, Ingram was so tired and as we were eating with our special guest, Pops (also known as my dad), he decided he wanted to crawl up in my lap and lay on me instead of eat. Mimi (also know as my mom), ate lunch with us Tuesday while she was in town before she went back to Jackson. I fixed up the wagon where he could lay down and take a nap while we rolled around and waited on our next appointments which were PT and OT. His PT evaluation didn't go too well but at least he had fun playing with balls and bats. His overall balance and lower body strength have changed and PT is going to be working with him to get stronger and more balanced. We knew he wasn't 100% back since surgery (granted it was only 13 days ago) but sitting in the background watching another professional evaluate him and seeing the things he couldn't do was a little more difficult on me than I thought it would be. OT was great and all his fine motor skills and cognition were either at or above his age level, including him drawing a "D" for daddy. I've got to teach him to draw my "M" because I'm definitely getting jealous now! We made it home without him falling asleep in the car so he actually got a real nap today; it started at 3 and ended at 6:30. Now, we're waiting for our friends the Callenders to pull into the driveway and hangout for awhile before they head down to the Ronald McDonald house. Alli is back in town for her scans and we're all praying for "ALL CLEAR" for her tomorrow. They are our friends that I mentioned in our Tuesday April 3rd post and their page is www.caringbridge.com/visit/alli_gator_callender if you want to read about their battle with Neuroblastoma. I know we're going to cry and hug and cry some more, but God put them in our lives from their first week at St. Jude and I believe He has used their journey to prepare us for our journey. Even though we have only been at St. Jude four days so far, every parent we've spoken with, regardless of which tumor brought them to St. Jude, feels like family. Bring it on Ependymoma; we're ready! We got Ingram's pathology report today, after ten days of torturous waiting. He also had a full day at St. Jude again, having an MRI, a lumbar puncture, and an echocardiogram. The results are somewhat mixed but net-net we are encouraged. The most important piece of the report is that he tested negative for a 1Q gain, a chromosomal marker that is indicative of the hardest ependymoma to cure. Furthermore, it appears that the surgeons were able to totally resect the tumor which is one of the really important determinants of success; and, there are no cells in the spine or spinal fluid according to today’s lumbar puncture. There was one spot on the brain that the radiologists were concerned about but Dr. Klimo, Ingram’s neurosurgeon, said that it was unlikely to be the tumor. The cells are aggressive according to the pathology report which is why they categorize it as Grade 3, anaplastic. We already knew this but they confirmed it today. Our treatment protocol involves six weeks of localized radiation and possibly four months of chemotherapy (we will know about chemotherapy next week). We have discussed photon radiation (the traditional method) and proton beam therapy (a newer method) and have decided to use the photon method. There are several reasons why. One of them is that the radiation oncologist at St. Jude, Dr. Merchant, has treated more ependymomas than anyone in the country, as we understand it. As he said, paraphrasing, “the type of gun may be less important than who is aiming it.” In addition, there is too little empirical data on the long-term benefits of proton beam therapy over traditional radiation in children over three years old. This is not to say that there is not a compelling argument to be made for proton beam, but we have decided that we prefer the risk-reward profile of photon at this point. We have some significant decisions to make about his treatment over the next few days. I am praying that God would give us clarity of mind and discernment. All of this stuff is taking a toll on Ingram. He is really tired and was unhappy with the doctors today who were trying to use his IV. It looks like it is taking on toll on Ashley already also, based on the fact that she has fallen asleep on the couch tonight. Ingram is pretty emotional right now and easily agitated. Please pray that God would give his little body strength, and for discernment for all of the people involved in designing his treatment. Please also pray that He would help us make wise decisions. We are very blessed to live in Memphis and have St. Jude at our fingertips. The doctors there are some, if not the, most respected in the world in the treatment of childrens’ cancer. We have complete confidence that God is in control of this. It is very reassuring to a father that I can rest knowing we have the best doctors available, and that I don’t have to go out searching for the best treatment for my son. So today started out with Ingram wanting to help his sisters get to school. He promptly told them to eat their breakfast so that they didn't miss the bus. But he was too involved in his cartoons and of course his coloring to remind them to "get a move on!" They were playing like they used too and Ingram was running around in the yard without socks while they were leaving on the bus; you see the sprinklers ran last night so the yard was pretty wet so his socks were pretty nasty, typical for a little man I think! Before we headed to the hospital, we stopped by the store for a bigger shirt that wouldn't get stuck on his head. We've always joked about how big his head was (he already wears a bike helmet that says it's a Youth 8+ on the label) but now we need a golf type shirt with a couple buttons so the hole for his head is larger and doesn't bother with his surgery site going on and off. We finally made it to St. Jude for our first round of labwork but it didn't go as smoothly as our first night in the ER. The IV is in and it's not going anywhere so that's good; it's actually under the blue tape on his left arm from the picture of the handstand competition with Lindsey. You can actually see a little of the scar from the surgery site and the reverse mowahawk a little too. The rest of our time at St. Jude today was pretty routine (or at least as routine as it can get on a second day with back to back appointments from 11:30 to 3:30). We ended our day at St. Jude getting his picture taken for his file by the photography folks and I think it was the best picture of all. He had his big smile just like when he was at the beach. They just know how to make a kid (and mommy) feel good about having to be there. The only other drama for the day was tonight when we had to flush his IV. He was screaming and his sisters were both begging us to stopppppppp!! It doesn't hurt at all, but he was just scared it was going to hurt so they wanted us to "quit torturing him!" You can have one guess who said that line again (read about the bandage removal if you don't know which of our girls that is). After we were done, in true Ingram fashion he said "Thank you Daddy" and dried his tears and went to mess with his sisters. No matter what is happening around here, there's nothing that's going to stop him from playing with his sisters and playing with his Beau. Brain surgery doesn't stop a handstand competition tonight! We are still waiting for the final pathology report from St. Jude. As of now, the doctors believe Ingram has anaplstic ependymoma, which is a worse diagnosis than we originally thought as we understand it. We expect to find out the final results this week at which point they will recommend a course of treatment. This will be a busy week at St. Jude for Ingram. He will be there every day this week. 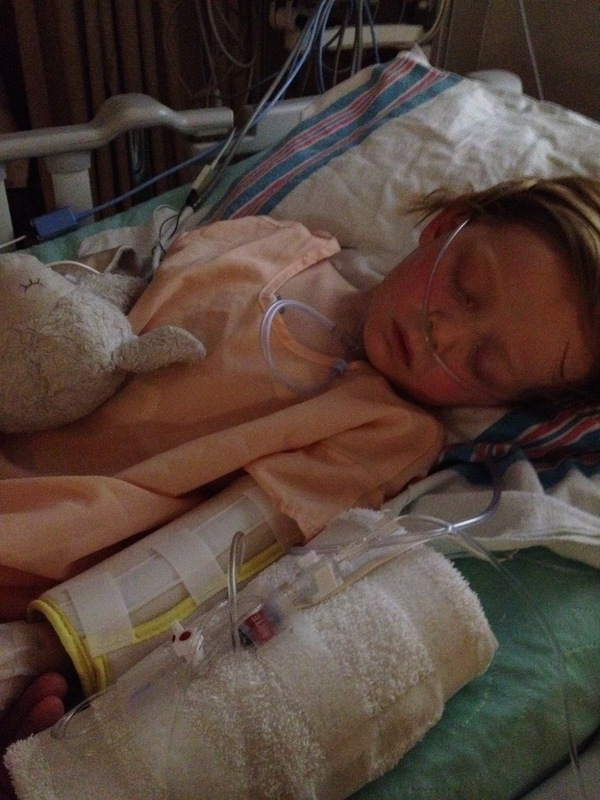 Please pray that God would heal Ingram through whatever means He would choose. We love you all. Ingram’s day started a little earlier than I think we were planning on. Beau (our dog) ran into our room and jumped into Ingram’s “little bed” and woke him up. You see, Ingram’s bedroom is upstairs and we didn’t feel comfortable with him being upstairs while he’s still a little unsteady on his feet. It’s very easy for him to get off balance for now and we decided to move a small mattress to our floor. Apparently that mattress is the first place that a dog would run to if he wasn’t sleeping in his crate like he is supposed to. I have a feeling that after I fell asleep during the movie, Beau was taken upstairs to have a slumber party in Lindsey’s bed for the first time. We started coloring and playing right away and then managed to get breakfast ready. The girls had soccer practice so they were off to the soccer fields and we stayed home and watched Cars again; I can’t count how many times we’ve watched this movie in the last two weeks. We watched Cars 2 at least 15 times in the hospital; that little stinker would watch it over and over again when he was awake. We played outside and thought about going on a wagon ride but Ingram told me he didn’t like the bumps so we decided to draw instead. Before his nap, we put Ingram in the bathtub and got his bandage good and wet. Yep, you know what’s coming next; it was time to remove the bandage. Lindsey was at home and was not happy at all with us. She couldn’t believe we were making Ingram cry and she was screaming at us to quit torturing him. Lindsey and Madison are both super sensitive when it comes to their little brother. They don’t want anyone to hurt him, and Ingram was definitely not a happy camper with Craig pulling off his bandage. I’m not sure which hurt more, the pulling off of the bandage or the knowing that someone is messing with my “boo-boo.” We finally got the bandage off and it looks great; they used stiches to close it so it resembles a train track running about six inches long on the center of his head with a reverse mowahawk haircut. They only shaved a strip on the very back middle part of his head and the rest of his hair back there was “styled” with some super hair gel that has been keeping it off his surgery site. Once all that was done, he was tired and ready for his nap. Once he woke up, it was back to coloring pictures and watching cartoons. I hope you’re seeing a pattern emerging with the things we have been doing. He has a new obsession with coloring and drawing now and it’s great. We have stacks and stacks of pictures that he’s coloring and drawing and he even tells us when he makes them for someone specific. He’s starting to learn to write some letters too and the first one other than his “I” for Ingram is a “D” for daddy and I have to admit I’m quite jealous of Daddy. Maybe I’ll have to teach him how to make an “M” for mommy tomorrow when we’re drawing. We had a fun night and had pizza and all watched another move. Ingram threw up tonight (he had thrown up a small amount yesterday morning too but I didn’t think anything about it), but this time it was a substantial amount and we both were quite concerned. We have a list of things to call the doctor for and vomiting is on the list. I was reading the list over and it also talked about fever so I took Ingram’s temperature just to make sure. Wouldn’t you know his temperature was the same one that they said to call St. Jude for so I get nervous and go to the other room to make the call. I talked to the nurse at St. Jude and told her everything and that Ingram was acting normal and that we really didn’t think it was anything to be worried about. She said she was sure I was right and said she was just going to run it by the doctor and for me to hold on for a second. She comes back to the line and says that the doctor is going to call us in a few minutes; we hung up and I gave the phone to Craig because I’d rather him talk to the doctor than me. When the phone rang, Craig went into the other room and shut the door and started talking with the doctor. I went into the kitchen and started cleaning up our dinner dishes just in case we needed to take a quick trip to the hospital. With being brand new patients of St. Jude and everything we’ve been through these past 15 days, I really didn’t know what to expect. I know that the part of his brain that held the tumor also houses the “vomit spot” in our brains. I think we both had the thought that the tumor might have grown back and was already hitting that spot and making him throw up again. Craig finally came out of the office after what seemed like an eternity and the first thing he said was “Man that was a really nice doctor.” I was trying to see if he was being sarcastic or not and he started explaining what all the doctor said and that we were right to call in just to check and told us more things to look for. The bottom line is that right now, he has no reason to be concerned because a tumor couldn’t grow that fast and Ingram had been acting fine up until he vomited and was acting fine afterwards also. Ingram is now fast asleep after Beau helps with reading a book, singing Jesus Loves Me, and saying prayers. This is another one of those recurring events; Beau has to lay in Ingram’s bed, cover him with kisses, and be there to read, sing, and pray before Ingram will close his eyes and go to sleep. What can I say, I’m pretty much going to do whatever Ingram wants for a while and I feel good about it. Most of the time, the girls and Craig are in there too so I guess it’s as Craig said to me the other day. It was something along the lines of “Loosen up and let’s make the most of what we can, while we can.” What would I do without a husband who sees the greater picture when I get caught up in the details of what I think needs to be done. Friday was a great day like Wednesday. We didn’t have to go anywhere and didn’t have anything to do so we stayed in our pajamas for a good portion of the day. Our morning was filled with lots of coloring, cartoon watching, and then a little afternoon nap to top it all off. Both Madison and Lindsey have “Bible Club” that meets each Friday afterschool at two different houses and they both wanted Ingram to go to their meeting. We rode in the wagon down to Lindsey’s Bible Club and she showed off her brother and then we picked up Madison from hers and she showed off her brother too. We finished the night off with dinner at home and a movie. I couldn’t tell you much about the movie because for the first time in my life, I think I fell asleep before my kids. I was even in the same chair as one of them and woke up in my bed. 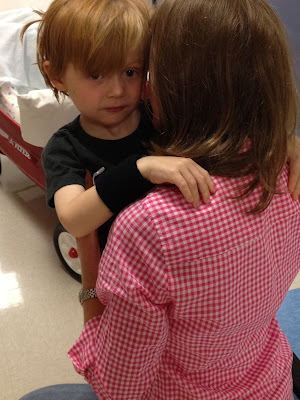 Thursday was our first visit to St. Jude as actual patients. We’ve been there several times seeing friends, but like everyone says, it’s completely different when you walk through the doors as a patient. I’ll admit that I was stalling leaving the house because I didn’t want to go to St. Jude and start this new chapter of our lives. We made it to the parking lot and then managed to get to these red revolving doors. The three of us hand in hand walked through the doors, but I think I was the only one that had tears rolling down my cheeks. We were greeted by the sweetest lady and she escorted us to a completely different building because we weren’t even in the right part of the hospital from the start. The three of us finally made it to our first appointment only about 30 minutes late. From the first “Hello” in E clinic, I knew that everyone around us wanted to help us feel at home. We had a long day with back-to-back appointments for about 4 hours and Ingram did not get grouchy one bit. 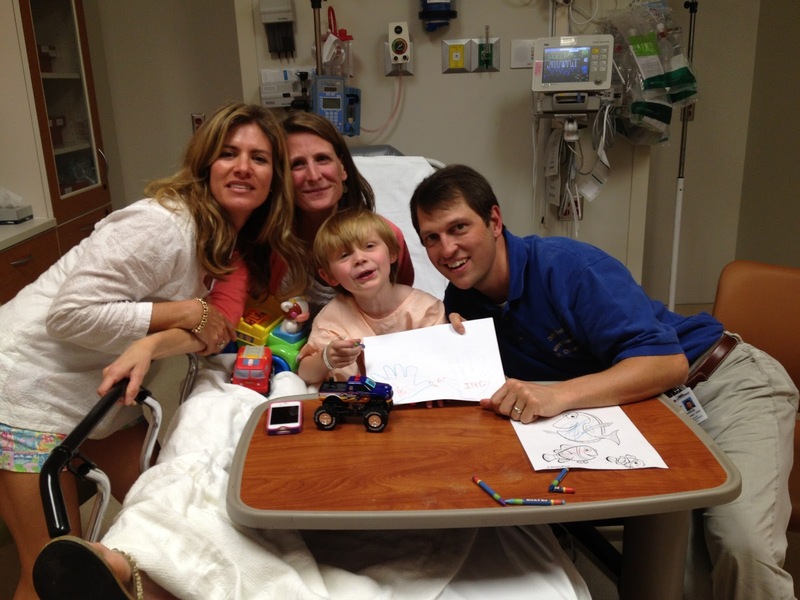 He played with us, with the hospital staff, and especially with the Child Life Specialist. By the end of the day, we had a ton of information, but we still had no clear diagnosis because they’re still running tests on Ingram’s tumor. St. Jude is running another test on Ingram’s tumor and we should have an answer Tuesday afternoon as to what specific tumor they think it is. Once they know the tumor type, the team will meet and discuss every aspect of Ingram’s tumor as well as his symptoms and then they’ll make a recommendation o f a course of treatment. The girls had a soccer game and they really wanted Ingram to come watch them play; really I think they just wanted their friends to see him and for him to show off his “boo-boo.” He cheered for Madison and Lindsey as much as his little voice could yell and by the end of the night (we went out to eat also) he was definitely ready for bed. It was a great first day at home. The girls of course had school, but were begging to stay home and play with their Ingram. I almost caved in, but knew they would be so excited to tell all their friends that Ingram was home. Ingram once again woke up asking for food and that’s always a good sign in my book. We spent Wednesday with Ingram and Craig watching Cars in the big chair together, Ingram coloring all sorts of pictures for his friends and for us, and of course keeping Beau off of Ingram and keeping Ingram from climbing up the cabinets. Things were starting to look like the normal chaos at the Dismuke house and we couldn’t be happier! I took the girls a special lunch to school and they both wanted to show all their friends the pictures of their brother. Really, they wanted him to come to the school and eat with them, but if you’ve been inside an elementary school cafeteria, you know why I said “NO!” I spent an hour answering all the questions that second and fourth graders could have and helped our girls feel better with being able to show their friends pictures of their little man. We spent the rest of the day doing normal things around the house and Ingram even took an afternoon that was more than an hour. The girls got home from school and were super excited to be greeted by their little man when they got off the bus. He was moving around more and starting to sneak around the house and do more things on his own. Needless to say, it took all of us to keep an eye on his as he kept getting faster with every hour that passed. We were having a really great day until another phone call. The doctors had their meeting today and were leaning away from medulloblastoma, thinking that it might be a different type of brain tumor, an anaplastic ependymoma. This type was still malignant like a medullo is, but this is potentially more aggressive and our night was not as exciting after that conversation. We finally got the girls in bed around 9:30 and then stayed up with Ingram till about 10:30 playing with trains and making a really cool train track through the den. Ingram woke up with a big appetite that started with a popsicle; I think it was an orange popsicle request that day. He was in a great mood and looked even better than the day before. We were excited to see how he would do in PT/OT, being in a good mood and also having all of his IV’s out. He had one in his foot that bothered him when he walked so we were really excited when they took it out. He decided to not eat his breakfast this morning so after his workout for the day, we were trying everything to get him to eat a good lunch. We had to convince him to eat real food rather than just popsicles. We tried everything from a baked potato with cheese and butter (his favorite), to grilled cheese, to McDonalds, to Wendys, and he shouted “NO!” to all of them. Finally I said Chic Fil A and he shouted “YES!” as loud as he’d been shouting “NO!” He ended up eating SEVEN nuggets and a whole fruit cup filled with grapes and mandarin oranges. Grapes, which are also his favorite, have been banned by LeBonheur since he had been admitted the previous Tuesday. When the doctors came around the second time that day, he had just eaten a huge meal, had been walking around the room more, and had taken his medicine without much of a fight. The doctors offered for us to go home and at first I was a little hesitant but the more Craig and I talked about it, I was ready to head home if they would let us leave. About three hours later, it was official…we were discharged!!! He was too excited about going home that he couldn’t take a nap in his hospital bed because he wanted to take a nap with his Madison, his Lindsey, and his Beau! We got home to balloons on our mailbox and our girls waiting in the front yard to see their little man. We had the best time being home as a family and the best nights’ sleep we’d had since being admitted into the hospital. It was soooo good to be home. We could tell that Ingram was starting to get even more back to normal. He was telling everyone “NO!” and not wanting to take any of his medicines. I don’t blame him though because they did smell pretty bad so I can imagine how they tasted. They were flavored cherry but Ingram still was not about to take them without a fight. So the medicines finally went down but about 15 minutes later they all came back up. He was exhausted after that. All of his doctors seemed to come by back to back and then PT and OT came also. We rolled him down to the PT/OT therapy room but Ingram really did not want anything to do with them. He started to cry and finally laid down in my lap instead of trying to play with the blocks. We decided to call it quits with therapy and headed upstairs for a nap. He slept for about an hour or so and when he woke up was a hungry and thirsty little man again. He didn’t eat much in terms of real food Monday for some reason so we were just trying to get juices and popsicles down him. 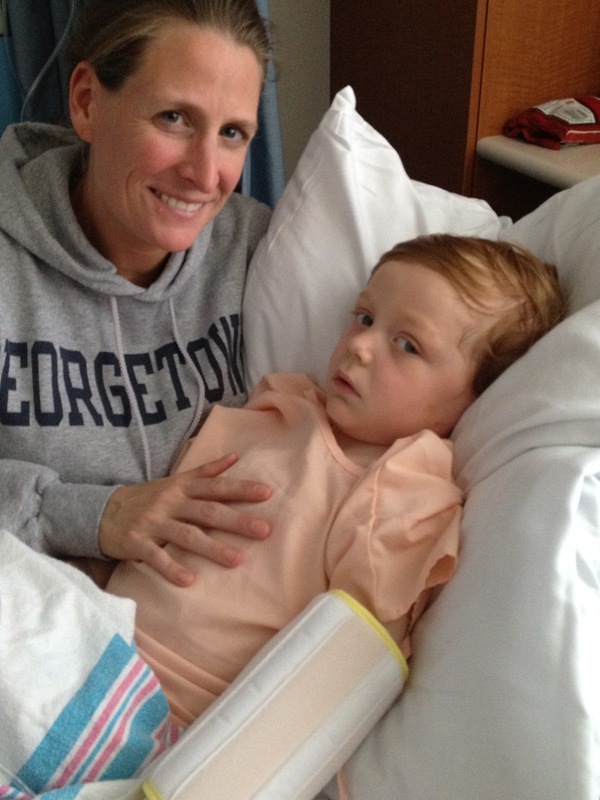 Finally, the moment we had all been waiting for happened… Ingram had his first poopie after surgery! It’s crazy how you celebrate such odd things, but we’ve dealt with surgery, pain meds, and bowel movements before so we were relieved once he was able to have one. All the juice and fruit we had been having him eat finally paid off, of course a little Mirilax helps out too! Sunday was Easter and what a great day it was! Madison and Lindsey came up first thing and were so excited to see their little man. He was talking a little more and had been awake for a while and was starting to stir around more in the bed. We decided to get him in the wagon and roll him around a little to see if another environment would help him to do more and maybe even eat. We spent some time rolling around the floor in the wagon and made it to the playroom and Ingram watched the girls as they played with the toys; he didn’t feel much like playing, but we could tell that he enjoyed being with his girls again. The girls had to leave for Jackson to a family Easter celebration and Ingram went back to his bed for a nap. Once he woke up, he said he was thirsty and hungry so we got him some food and amazingly he kept it down. He also wanted a popsicle (he had said no to popsicles ever since surgery so we were very excited about this) and picked out a purple popsicle. From then on, he pretty much was eating and drinking the rest of the day. He even wanted to go to the bathroom in the potty rather than using his “bed potty” which was the urinal. We were trying to get him to move his neck more so that it would become less stiff and sore while he was in the bed. Craig asked him if he wanted to walk to his bed after he used the bathroom and he said yes so we had grandparents ready with a camera to record his first steps after surgery. I was guiding him by holding his hands and Craig was holding around his waist because his balance was off still, but he walked from the bathroom to his bed and it was wonderful to watch! Around 4:45 they took Ingram for a CT scan to see if he had any swelling. He was not happy about being moved from his bed to the CT but that was the most he had been moved since waking up after surgery. When the doctors came to check on him, Ingram’s vitals were looking very good and his CT scan that morning showed no swelling, so they sent us back upstairs to our 7th floor room. Ingram continued to throw up and sleep off and on for all of Saturday. He got out of the bed for the first time around lunchtime and was moved into my lap by Physical Therapy. Ingram had been asking us to pick him up and reaching out both hands for us to hold him. It was soooo nice to hold my baby boy in my arms again. It seemed like forever since he had been in my lap, and he spent about 3 hours sleeping in my lap just like a baby. It was wonderful and I have to say Craig was quite jealous of my special mommy time! Ingram woke up and started to throw up again so we put him back in his bed to rest. Each hour we were thinking he was doing better and looking better, but he would continue to not be able to hold down any ice chips or anything. At the same time, he was starting to be awake a little more at a time. At 6:30 am in our hospital room, Ingram was already dressed for surgery and both sets of our parents and our pastor met us in our room to pray one last time as a group before we roll Ingram down to surgery. We spend about 10 minutes in prayer before we get the call that they’re ready. Our parents give Ingram hugs and we roll out in the wagon with Ingram not knowing what is about to happen to him. At 7:30 am, Craig and I were pulling his wagon and got to the double doors where we would have to let him go; that was the hardest moment that we have ever encountered including everything involved with Craig’s heart stuff in 2007. It’s one thing to let go of your husband’s hand as he’s rolled into open heart surgery, but it’s totally different when you’re letting go of your only son not know what might happen during the next few hours. We were told to expect his surgery to last anywhere from 5 to 8 hours and that we would be called each hour once surgery had started by our OR nurse with an update from the doctor. We got the first call at 8:30 saying that they were starting and that Ingram did great getting sedated and he had been happy even till that point and they reminded us that they would call in an hour with the first update. While we were waiting for the next call, the lobby of the 2nd floor was starting to fill with friends and family; the rest of the hospital was empty since it was Good Friday. About an hour later we received our next call, but this time our nurse said that the doctors wanted to meet with us in the Conference Room 1. Since we were told there would be phone calls and surgery would last 5-8 hours, you can imagine all the thoughts that were going through our heads. 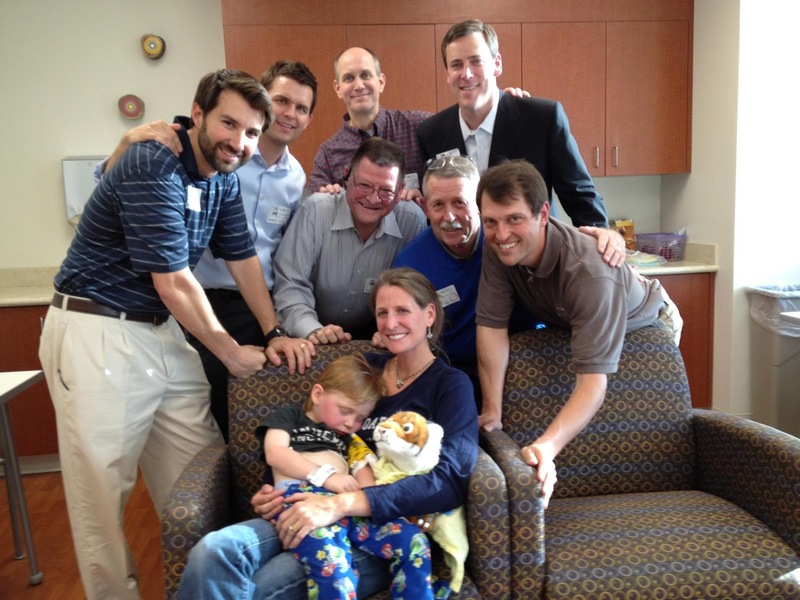 Craig held me as we wept and prayed and it seemed like hours until the surgeons came into the room. While we were in the little room, all of our family and friends gathered in prayer as most of them were thinking the same as we were. As both surgeons entered the room, we couldn’t see any emotion on their faces and then they sat down right across from us. One of the surgeons looked us straight in the eye and smiled as he said “Well, I think we got it all.” A flood of tears started running down our faces as the doctors continued to talk to us about how the surgery was going. Next while he was still asleep and his brain was open, they sent him through the MRI to see if they got everything. The OR nurse called back about 35 minutes later and said there were two spots they surgeons didn’t like on the MRI so they were going back in; we were on the downhill portion of the emotional roller coaster with this news. So we all gathered in prayer again as they were going back in to look at these spots. About another hour later, we got the call that they were closing Ingram up and we would be able to see him in about 15 minutes in ICU. Our nurse didn’t mention the two spots so Craig asked about them and we were told that they were nothing to worry about. What a relief we felt at that moment! Our son had survived surgery, the complete tumor was removed, and we could see him in a matter of minutes. While Ingram was in ICU, he pretty much did two things, slept and threw up. When he was sleeping from all the medicine he would hold my finger and squeeze it while I talked to him. When he was awake, we would try to get him to eat ice chips or sip water only to have him throw it up shortly after. We were able to stay with him in ICU the whole time and Craig was able to get some good rest. With Ingram throwing up all the time, he would reach for me or squeeze my hand harder if I started to step away. One time, though, Ingram let Craig hold his hand instead of mine and that was so sweet for Daddy. Of course, he threw up again and asked for Mommy. Madison and Lindsey were able to come up and see Ingram while he was in the ICU and they even helped his nurse check his vitals and we explained with them even more. Seeing their brother and having him tell them “I love you” seemed to do wonders for all five of us. We had no procedures that day so we just played and took tours of the hospital in our wagon. Our girls came to the hospital that afternoon and the Child Life Specialist went through a book with real pictures to show Madison, Lindsey, and Ingram what everything would look like before, during, and after surgery. They had pictures of the elevator he would ride down, the hallway he would go through to pick out a toy, the pictures on the wall in the pre-op area, the operating room, the lights on the ceiling, what the doctors and nurses would look like with and without masks on. Child Life even had hats, gloves, and masks for all three of the kids to wear. They let them smell the different scents that Ingram could pick from for his “sleepy gas.” After smelling them all, we all decided that the root beer was awful; the girls choose cherry and Ingram choose orange. That evening, about 15 guys came up to anoint and pray over Ingram; I had the privilege of holding Ingram in my lap as they poured out their hearts to God for my son, my daughters, my husband and myself. They also prayed for God’s will to be done and that we would accept whatever happened during the surgery as God’s plan for Ingram. They prayed for our surgeons and other doctors that would be in the operating room, for the operating room staff that came in on a holiday so that Ingram could have his surgery as soon as possible, for the recovery room staff, and also for the ICU staff that would be taking care of Ingram right after surgery. I have never been so touched by prayers before in my life; there is something very special about hearing the hearts of men crying out to God on behalf of my only son. The doctors sedate Ingram to do an MRI of his head and spine with and without contrast to get the best images possible of the tumor. 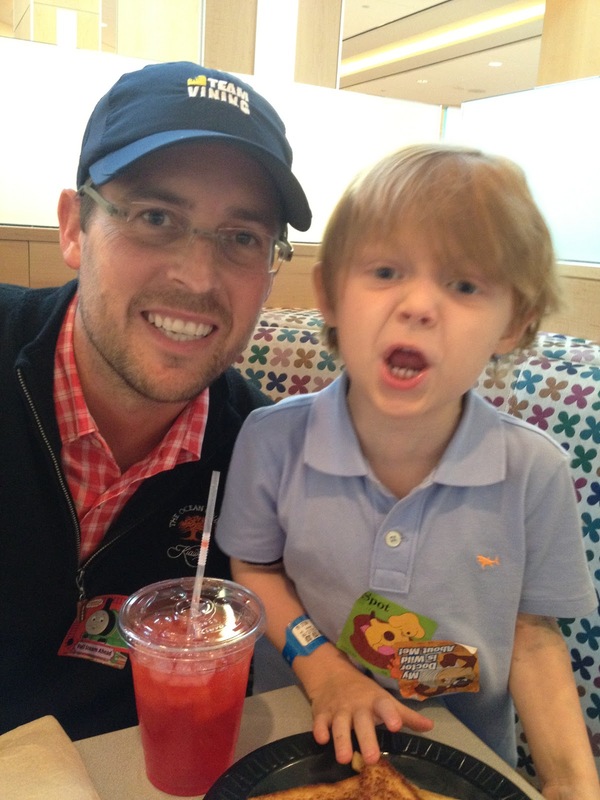 They come back to us with the scans that afternoon and show us the tumor and talk more about medullablastoma. The concerns they have are that it might be connected to the brain stem and the cerebellum and that it’s starting to cause hydrocephalus, which is fluid on the brain. They are able to see blood vessels that they’ll need to work around and they can see the areas where they believe it’s attached to the stem. The brain stem controls all of your gross motor skills including walking and talking and is very delicate. They have to be very gentle with it and cannot be rough with it like they can be with the cerebellum. They were explaining the risks and all the different things that could happen as a result of it being connected with the brain stem and we were all praying that it wouldn’t be attached. Of course we were thinking that with as big as it was it was most likely attached and they would end up having to leave parts of the tumor on the stem so as to not damage the stem. After the MRI that morning, Ingram began taking steroids to control the swelling and, oh, what a bear he was being. He has a lot of energy anyway, but now his energy had been given an attitude and an appetite that we were having a hard time controlling. Luckily, there was a phenomenal playroom at the end of the hall and he would play in there for an hour or so at a time with folks that were visiting because our small hospital room was not enough to hold him in. 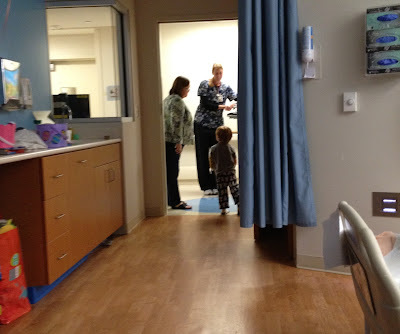 He quickly found out how to get whatever he needed and proceeded to chase his nurses down in the hall to ask for things like popsicles, juice, more popsicles, and butter. Yes I said butter; he decided that he needed more butter for his potato Wednesday night. Since his nurses get everything else for him, he figured that they should get him butter too. Unfortunately, they didn’t have butter on the floor but promptly asked if he wanted another popsicle so he started walking with them to get another one. Lindsey was next to me at the computer. She happily answered the phone, acting so goofy. I finally got the phone away from her to say “Hello.” I heard our pediatrician on the line and said “Oh, you got the results back quickly. Is it migraines?” For some reason, I knew when he started talking that it wasn’t good news. I was listening to his words but didn’t really hear what he was saying. He began by saying he was all the way in East Memphis already or he would come to our house to talk with me. When he said that, I looked directly at Madison with my eyes full of tears and asked her to call Daddy. He kept talking and honestly I don’t remember what he said at all so I went to our back porch and sat down on the chair and he started over and that time I heard it. The words that I remember are Tumor, Brain, Hospital, Neurosurgeon, and Now. By this time, I’m in full blown tear mode and Madison is getting upset because she can’t reach daddy. So she emailed him saying, “Call mommy now. Ingram needs surgery :(“ and then signs her traditional “Madison : )” I called our sitter (she was coming over anyway for a dinner we were going to with friends later that night). So she came a little earlier than expected. Then I called our friend down the street that also goes to church with us and just started rambling. I feel sure I didn’t make any sense but at least they knew something was going on with Ingram and knew that a sitter was on the way to our house. At this point, I still hadn’t gotten a hold of Craig and was walking around the house in circles trying to figure out what I was supposed to do. I finally got in the car and was buckling Ingram in at the same time as I was calling the main line at Craig’s office. When they answered, I think I said “This is Ashley Dismuke, I need Craig; we have a family emergency.” Right as they were putting me on hold my phone beeps and it’s Craig calling back. I switched over and started crying, trying to talk to him. I have no idea what I said other than I’m coming to pick you up. I started driving to his office in the rain with tires that are bald and with eyes full of tears. Ingram is in his seat behind me with his markers. We found out later that not only was he painting his leg with the markers, but that he was also painting the back of my seat blue. I called my friend, Stephan, as I was driving down Poplar but I couldn’t say any words; the only sound coming out was crying. Luckily she knew something was going on because after I had hung up with Craig, he had called her husband – who had then called her. Her husband, Chris, left his office in Collierville and stopped at our home to pray with our girls who were scared and he explained what was happening. She already had her children gathered together praying and one of her babysitters had just stopped by to catch up and joined them on their knees. The sitter who just happened to stop by stayed to watch their kids so Stephan could meet me at the hospital. The next person I called answered the phone and was talking and laughing about how she was in the middle of nowhere and was going to probably lose my call. But then she heard the tears and immediately started praying over the phone not knowing what was going on. I was able to get the words Ingram, Tumor, Hospital, and Neurosurgeon out and she, too, started crying. You see, two years ago we met her as a complete stranger and walked alongside her and her husband as their daughter was diagnosed with Neuroblastoma . We cried together and she told me that I had just joined a club that no one wants to be a part of and then we cried and the call dropped. I pulled into Craig’s office and he was standing outside of the front door waiting for me. I got out of the car and just hugged him and cried. He said “It’s going to be okay” and then he got in the car and started driving. He asked me where we were going and I said, “I don’t know.” I said we were supposed to go to a hospital but I didn’t know which one we were supposed to go to. It’s 5:15 by this time in Memphis and there’s no way to get around the traffic. We start driving but traffic was so bad that we had to go a longer way than we planned. By the time we figured out where the hazard lights were we had almost been the cause of two different wrecks. As we were driving, Craig got our pediatrician on the phone again and he told us to go to LeBonheur. As there were talking, I wrote this word on a napkin as our doctor spelled it for Craig and he then spelled it for me … m..e..d..u..l..l..a..b..l..a..s..t..o..m..a. Based on the CT scan, this is what it appeared that Ingram had; but, they didn’t know for sure. We get to the ER of Lebonheur and Stephan Rowland is already there. She had already started our paperwork. All I do is walk up to the desk, tell them my name, and they take us straight to the back. I think it was there that I looked at Stephan and she hugged me and I fell apart again. We went from the desk to triage to our ER room with a former Lebonheur ICU nurse (Stephan) by our side the whole time who just happens to be my best friend also. Craig comes in from parking the car and within five minutes her husband Chris is there as well and we’re just praying together. All the while, Ingram has no idea what’s going on. He’s just a 3 year old little boy with a leg colored blue with markers, who is having headaches and throwing up. We are admitted to the hospital and eventually go up to the 7th floor which is the NeuroScience Institute where all the brain tumor patients go. The whole time we’re there, it’s a non-stop parade of family, friends, hospital employees that are friends of friends, and even strangers who heard about Ingram all the way through our hospital stay. We were back at the pediatricians office. After examining him, our doctor was also thinking early onset childhood migraines. He ordered a CT scan to look at his brain and rule out anything more. The thing still bugging our doctor was the placement of his headaches because they were in the back of his head rather than the front. He had a couple more headaches Monday but was still acting like normal in between the episodes. The pediatric radiologist at the CT scan place wasn’t there Monday so we were scheduled for the next day. Ingram had several more headaches over the weekend but was playing regularly in between them. He was still taking his naps, sleeping well at night, and even eating a lot. We had friends over for dinner Sunday night and it was the first time Craig actually saw him have a headache. He had two within just a few hours. It was at that point that we were a little more than worried. Our friends that were over have a son who was just diagnosed with childhood migraines and we started thinking that maybe Ingram was going to have early onset childhood migraines. I had already been researching online and it made sense for it to be migraines because I used to have them, my sister still has them, and our Granny has them too. Ingram had another episode with vomiting and I was starting to get concerned. The whole family was recovering from the flu, with the exception of Craig, and I was going with the assumption at first that these were sinus headaches with vomiting caused by the drainage that he was swallowing. After all, I was even still having drainage and headaches. 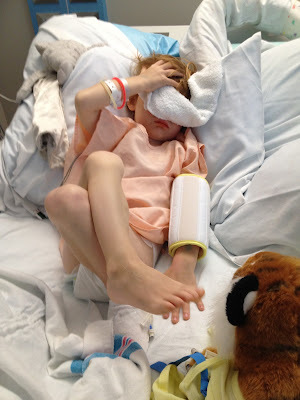 He had another headache that afternoon and I called our pediatrician who told us to watch him over the weekend and come in first thing Monday morning if he had another episode. They were thinking the same thing - sinus pressure and drainage from being sick; they had seen him that week for the drainage anyway and it was still the same stuff it seemed. Ingram’s teacher from Preschool called and said that he had a headache and needed for me to come check on him; he was crying a lot and not really acting like his normal, happy self. We (Madison was with me since she was still at home from having the flu) picked him up from preschool, came home, and then watched a movie with Madison before he took his nap. Thursday night he had another headache so we stayed home from Madison and Lindsey’s soccer game and just rested. When he has had the headaches, he would cry a lot and sometimes throw up, but was always very hard to console. Each one lasted for 5 to 10 minutes and included really hard crying, big tears. Then he would be exhausted and half the time would just go to bed. (For you mothers who are going to worry when your child has a headache, don’t worry, these headaches are unmistakable).